These are, hands down, the best Oatmeal Chocolate Chip Cookies I have ever made and probably the best I have ever eaten. I will grant you that I am predisposed to like any kind of oatmeal cookie, but these really are fantastic. They have a perfectly crisp edge and just the right amount of chewiness in the center. 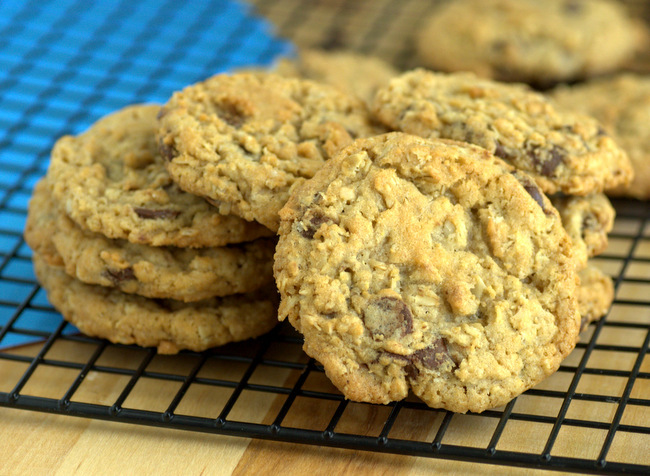 They are buttery, without being greasy at all, and hit a perfect balance with just the right amount of chocolate chips to appease any chocolate lover, but not so much that the flavors of the oats and vanilla are drowned out. The recipe comes from the The Frog Commissary Cookbook, which was originally published in 1985 as a collection of recipes from Philadelphia restaurateur Steve Poses. The book is one that many Philadephians swear by – and for good reason, as the recipes are delicious and reliable. As I have family out in that area, I suspect that more than one relative of mine frequented the restaurant, which is probably how my mother ended up with a copy of the cookbook. She started making the cookies and, after a time, so did I. The book says that the restaurant would “sell this cookie the way that McDonald’s sells burgers: they fly out the door.” They also note that they were “irresistible,” even to employees who were around them every day. So you don’t just have to take my word about how good they are! This recipes uses a straightforward drop cookie method and is easy to put together, though the dough is very thick with oats and you’ll need a little bit of elbow grease (or a stand mixer) to get the chocolate chips mixed in. When I was a kid, I couldn’t handle the last few minutes of mixing, so I usually just snagged a handful of chocolate chips for myself and had a parent help me out. The dough comes together quickly and easily, so these cookies can be ready at the drop of a hat when a craving strikes. The recipe also makes a very large batch, so you’ll have plenty of leftovers. I typically use quick cooking oats in this recipe. They are cut more finely than regular rolled oatmeal, so the cookies have a fairly uniform look and distribution of the oats. The regular rolled oats can be used, but the cookies might have a slightly more rustic look to them. If you want the best of both worlds, use a combination of the two. I also use semisweet chocolate chips, but chocolate chunks and darker chocolate chips can also be used with excellent results. Leftover cookies can be stored in an airtight container and will last several days. You can’t go wrong here. Trust me. In a medium bowl, stir together the flour, baking soda, baking powder and salt. Either by hand or with the mixer on low speed, gradually beat the flour in to the sugar mixture until just incorporated. Stir in the oats and chocolate chips by hand. Dough will be thick. Bake at 350F for 10-13 minutes, until golden brown at the edges and light golden at the center. Makes 3 1/2 – 4 dozen. If you chill the dough for about 30 minutes before baking, you will have a slightly puffier cookie. You can add up to 1 1/2 cups chopped nuts in addition to raisins or chocolate chips. You might want to make the cookies slightly larger if this is the case. These have become our “famous” cookies! what would you do to add 1 c.shred coconut as well to this recipe? I think that would be a nice addition! I was wondering extra liquid or extra egg?? for that 1 c.coconut as well? These are the best oatmeal chocolate chip cookies I have ever had and made. I made them for my fiance and he couldn’t help himself. He wanted to eat them all! I am making them today, but I am going to add butterscotch chips instead. =) Thank you for this recipe! I am forever grateful. Thanks for this amazing recipe. My humble addition is FRESH or frozen whole cranberries (NOT dried). The cranberry/chocolate combo raises these amazing cookies to a whole other dimension. Hey, these look awesome, but I wuz wondering if they could me made into bars?? Thanks! This may be a dumb question. But the recipe calls for butter, does this mean unsalted or regular? The “default” for just about all baked goods is unsalted butter, so that is what I always use in my recipes unless otherwise specified. That said, salted will definitely work in this recipe with no problems. I generally advise cutting back on the salt in a recipe a little bit if (a) you use salted butter and (b) are sensitive to salty flavors. Thank you! And do you know the calorie count of a cookie by any chance? I made these cookies last night and followed recipe meausrements and directions exactly and put dough to chill for 30 minutes, when first out of oven they were perfect, crispy on outside soft on inside but they spread a bit thin and once cooled, they werent soft and chewy anymore. Just wondering if you have anu suggestions/ common solutions for why cookies spread like this? And try chilling the dough longer next time! I made these cookies and subsituted the sugars with splenda and they turned out good, they are really chewy. Great recipe . I jusT made these and they were delic! I substituted half the butter for coconut oil and half the flour for whole wheat flour. A little present for our 3 rd wedding anniversary! We love this cookies, but we all pecans and raisins. Thanks for sharing this recipe. This is more of less what my recipe consists of. I usually add a little more salt as I like to be able to taste it. The other thing that I’ve found is to brown the butter. I start with straight from the fridge, cold butter. Half of it goes into a pan over medium heat, cook until it foams and turns a nice shade of brown (the solid bits, not all of it). Remove it from the heat and add the other half. Mix and let set, it will even out to around room temp. From there follow the directions as here. This imparts a toffee like flavor that really goes well with the oats and chocolate, not to mention the salt. Thank you for sharing this recipe! I made these as a little Christmas present for family and friends. My mom loved them (and I know she did have a second cookie right away!). The amount of chocolate chips really is perfect. I added some chopped walnuts too. Another great recipe on Baking Bites! I must have made this a dozen times, made it again tonight, been asked for the recipe… thanks! I have made these exactly as described at least 4 times. Really chewy. Love them as do the kids. Thank you for a great recipe! I followed a couple comment suggestions and shared an “adapted” recipe on my weekly kitchen recap. cheers! Oatmeal Invasion! « Ð¯Ð¼ (Yom) Yum!